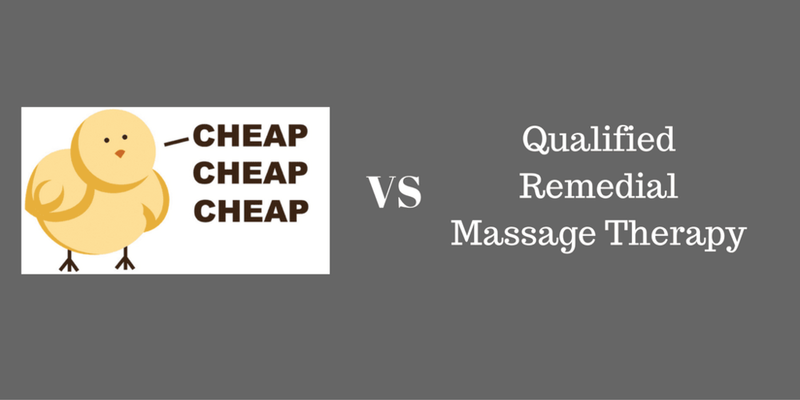 I get asked all the time..."What is the difference between Remedial massage and other types of massage?" In general it is the level of training that goes into it. Current Remedial massage therapists have to undergo years of training to achieve a Diploma of Remedial Massage. This is a nationwide, government recognised, association accredited qualification. Without the Diploma you can't call yourself a Remedial Massage Therapist. To be a Remedial Massage therapist you also have to be a part of a recognised association that allows you to be able to claim through health funds and have a minimum of $1 million indemnity insurance. The biggest issue these days is the influx of Chinese and Thai massage places that are popping up. We've all seen them and most of us have tried them when we have been desperate. Generally they offer a convenient, cheap general massage that is at best average. The problem is when you have an injury. More often than not these practitioners aren't trained to deal with your issue and also don't have the English skills to understand what is wrong with you, but they will treat it nonetheless. For example, if you have a potential disc injury in your lower back, and you think that a bit of massage might help loosen it up, then the massage therapist puts a lot of pressure onto your spine and may stretch you in lots of extreme positions, such as in Thai massage, then you may not be walking out of there. Other issues can be the cost. People usually assume that it is cheaper massage. In most cases they charge anywhere from $60 - $90 per hour. This isn't a lot cheaper than most clinic located remedial massage, especially when you take into account the level of training and quality of the treatment. One other thing on the topic of health funds, is there are a lot of disreputable places that have one practitioner who is qualified and has health fund status. They use this persons heath fund provider number to run all of the practitioners in the clinic through, even though the others are unqualified. This has recently been investigated by Medibank Private and at that time put a hold on giving out any new provider numbers. This was penalising all of the new Qualified Remedial massage therapists because there are some unsavoury characters out there who are bringing the industry into disrepute and also providing dangerous treatments with no regard for their clients. You can rest assured that they also wont have indemnity insurance if something were to go wrong. Another unsavoury issue can be the expectation of "happy endings". When you go in for a massage at some Chinese and Thai places you can sometimes get more than you bargained for. Some of these places are fronts for brothels or sexual massage services. So before visiting a Thai or Chinese massage clinic ask around and get some advice on where might be reputable. The short answer is if you want to take the risk then it is up to you. But if you want a great massage, from a qualified practitioner who can understand your needs and treat your injuries with knowledge and care then you need to go for Remedial Massage.